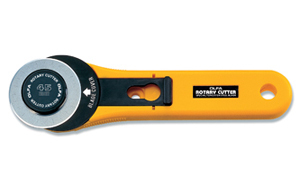 OLFA Rotary Cutter RTY-2/G Model 9651 is a 45mm Rotary Cutter. 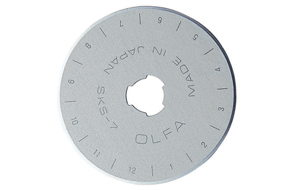 This Cutter was introduced by OLFA in 1979, and has changed the quilting and sewing industry. The most popular size available, this cutter features a blade safety cover and handle is designed to reduce hand fatigue. The cutter is a rolling razor blade used to cut fabrics into shapes, strips and pieces for sewing, quilting and craft projects. Accommodates both right and left handed users. Comes with 1 RB45 blade. Uses replacement blades RB45. Perfect for general quilting, sewing, and craft projects. Can also be used in industrial applications. OLFA Handles Are Guaranteed Forever.